Halloween is synonymous with a lot of things these days, one of those being horror. We go out of our way to watch scary movies and visit haunted houses, reveling in the spookiness of the season. As you get ready to celebrate the holiday, give yourself a good scare by reading these property management horror stories. Silverfinshark, a user of the website Reddit, has experienced several frights over the years, witnessing his parents deal with multiple problem tenants. From reality television celebs to suspicions of ghosts, they’ve dealt with it all. We rented to a winner of big brother the TV show, he moved in with his girlfriend and kid. Few months pass and we end up finding out he got arrested up in like MA for going to meet an undercover agent for drugs. When his girlfriend and kid moved we cleaned the unit and found drugs dropped into the locks on doors, on top of the cabinets in the kitchen and even in the tree in the backyard. Dude was sketchy when we met him to rent, paid in cash only and he had that bulgy eye look like he was strung out. Horror movies often feature a variety of gross creatures that we like to squirm at the sight of. Reddit user iEatMagikarps, however, can tell you that they’re not as fun in real life. Kindness Killed the Black Cat? There are certain ‘rules’ in horror movies, and sometimes an act of kindness can be someone’s undoing. Another Reddit user, Sloth_Reborn, has witnessed this first hand when tenants tried to take advantage of a moment of sympathy. “Once had 2 tenants, an older couple, rented to them for about 6 months before they stopped paying rent. I showed up there, talked to them at the door after they had been ducking my calls for over a week. Really I’m a pretty lenient guy, not quick to evict – I just wanted to know what was going on. They told me that their only child died – got shot through the floor of an apartment building – and that the funeral cost a lot. I was sympathetic, told them hey – do what you can. Sorry that happened, just try to get it together. They don’t pay rent for 3 more months, keep ducking my calls. I show up there this time and they get (expletive) with me – like it’s somehow my fault when I’ve already been so nice about this. The conversation ended with them slamming the door in my face. The next week I get a call from the police, they raided my tenants and found felony quantities of pills – told me of they have another incident with one of my properties they’d shut it down for public nuisance. I wrote up eviction papers that day. They ignored the 3 day notice, had the lawyer send a server for the court date – they didn’t show, and we’re given another 30 days to move. They didn’t move, sent another server for the next part – they didn’t show again, had to pay $600 to have sheriff’s forcibly remove them and store their stuff in storage. I get in the house, they tore out the drywall, stole all the fixtures, used 1000’s of staples on every door frame and window, broke the refrigerator, stove, faucet, left a huge water leak in the basement ($1800 bill), tore up the carpet, and finally booby trapped the yard with uncoiled springs. It was devastating financially, nearly cost me the house. Total costs, just materials as I did all the labor myself taking nearly 3 Months, was around 4k, plus the 9 months I didn’t collect rent, the lawn mower I busted… total was somewhere around over slightly over $10,000. I documented everything and sent it off to collections, it’s been over a year and I still haven’t seen a penny of that – nor do I ever really expect to. Stories like these are quite scary and can leave any property manager shaking in their boots. While you might currently use tenant screening in your leasing process, make sure the screening reports you depend on provide through, quality data. 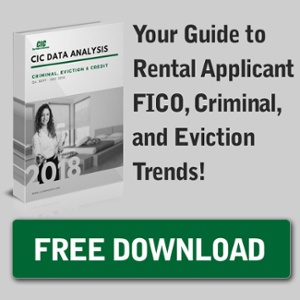 Without quality tenant screening data, you could develop a few horror stories of your own.